Theatre BSMT’s season opener Liar, by Brian Drader, ran October 6 – 10 at Motel Theatre. 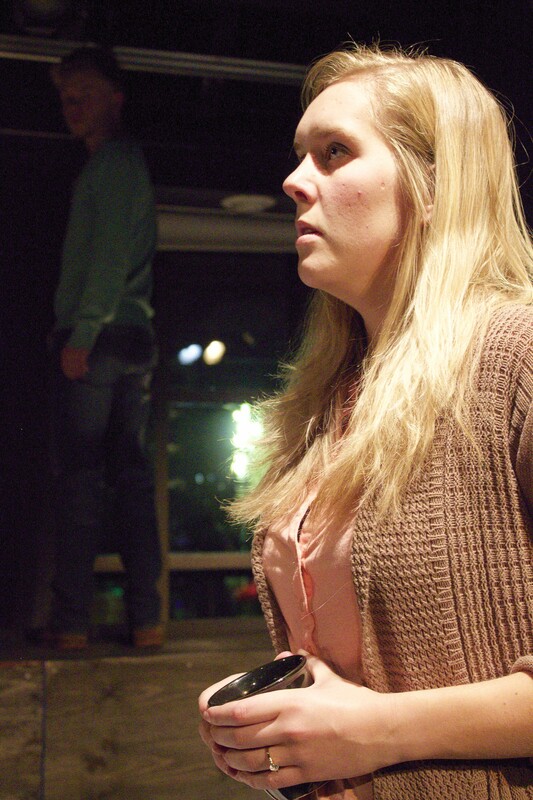 Pictured: Carolyn Ruether (Sherri) with Simon Tottrup (Jeremy) in background. Image provided by Theatre BSMT. The truth is invaluable, or at least we like to think it is. There are times when honesty is not the best policy because sometimes, the truth is unkind. When truth becomes displaced, white lies make lofty nests. And as Ben and Sherri Ingles (Grayson Ogle, Carolyn Ruether) discover in Brian Drader’s Liar, these nests are lined with patient thorns. Presented by Theatre BSMT, Drader’s Liar tells a compelling story about family, loss, and the lonely journey towards closure. And it begins one night at a gay bar where Sherri’s estranged brother Jeremy (Simon Tottrup) meets a strange drifter named Mark (Corey Joyce). And maybe the reason why Jeremy joins Mark on the roof of a building for some beers is that he seems harmless enough, despite leading Jeremy on. The next morning, Jeremy is found dead, and only Mark can answer the question of whether he fell or jumped. Ben and Sherri’s marriage is in trouble, the love that was once there is just an act these days. Ever since their four-year old son disappeared, Ben and Sherri have never been the same. And so, Sherri becomes desperate to establish a relationship with the person who was there for her brother’s last hours in order to find closure. Unfortunately, the closure Mark provides is dishonest. Mark was neither Jeremy’s boyfriend, nor a co-worker at the hospital where he worked. Slowly, good intentions reveal themselves as something more sinister. The Canadian playwright demonstrates the shattering effect of loss on the human psyche. Ben is quick to suspect Mark has ulterior motives, especially as he starts entering deeper and deeper into the couple’s personal lives, while Sherri takes anything this stranger has to say about Jeremy (and himself) as gospel. The audience may find Sherri gullible, if not totally irrational, but is she really? Consider how psychic mediums claim to have the gift of communicating with the deceased, and the fellowship they amass by those who so desperately want to believe. From the outside, the whole idea is nonsense, but to those affected by loss it is something, which is easier to accept than the complete absence of a person. And it is this vulnerability that Mark preys upon. What makes Mark such a threat is that, as a drifter, he has nothing to lose, and everything to gain. Given this, Mark can be anything anyone wants him to be, as he shows with Ben who he wins over by becoming his new drinking buddy. In Mark, Drader reflects the malleability of truth, the versions of truth we seek out and, sometimes to our own peril, lose ourselves in. Unfortunately, DJ Gellatly’s direction feels too relaxed for such a gripping narrative. If the production’s pace were tighter, then perhaps the pauses and silences would be more effective than they are. As it is, Gellatly traps himself and his actors within a fairly limited range where these breaks have little significance in the face of the menace and anger from which they are born from. Where Gellatly has some success in the staging of this play is in keeping the actors actively involved at various periods within this web of broken truths on stage. Something so simple as having Ogle review his tapes downstage while a scene plays out upstage behind him benefits the dramatic tension by adding layers to the action. Ruethers’ has some difficulty capturing the emotional nuance of her characters’ arc, effectively lacking punch when the script calls for it, but there are moments where the young actress really digs inside and shines. Ogle is very expressive as Ben whose emotions read clear across his voice, face and gestures. The actor moves with tremendous purpose, even when the character is unclear of the situation. And that makes it all the more unsettling how such a strong-willed character is won over by a mysterious stranger. Jeremy, who appears briefly throughout, is played well by Tottrup who delivers as a troubled youth in need of presence. Joyce has the challenge of playing a manipulative character ready to change persona at the turn of a dime, and ultimately it does prove too challenging for the actor. A part of the problem is that Joyce rarely shows the same genuineness with Ben and Sherri that he does in scenes with Tottrup’s Jeremy. The audience is never given the chance to doubt Ben’s suspicions about Mark, to be surprised when Mark’s true colors are revealed. Joyce’s performance as the evening’s catalyst for emotional ruin leaves much to be desired. The use of the Motel Theatre’s windows as both the city’s nightscape and Ben and Sherri’s house windows is smart given the theatre’s limited space. Lisa Floyd’s atmospheric lighting design makes the theatre space feel intimate, if not deeply personal. Although it may fall short in some areas, Theatre BSMT’s production of Liar still manages to provoke its audience to consider the many ways we lie to each other and ourselves, and what that means in the long run. And no doubt audiences will think about this on their way home from the theatre. Theatre BSMT’s production of Brian Drader’s Liar ran Oct 6 – 10 at Motel Theatre.